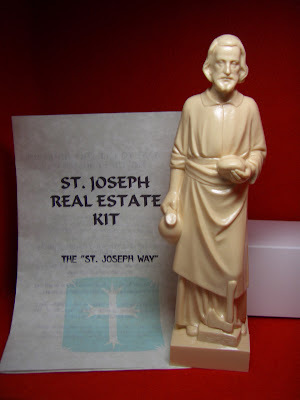 With the housing market still dismal, the Catholic tradition of planting a statue of him as a way to help a house sell is going like gangbusters online, in stores selling religious goods and elsewhere — even if home sales are not. He added that the statue had helped him sell a house and a condominium in the past few years. It’s not completely clear when the tradition began, and devotees disagree over how best to participate. Head down? By the “for sale” sign? In a flowerpot? But it has been adopted by many real estate agents, who suggest that sellers, particularly in this market, give the statue a chance. And so, for whatever reason, the statue has plenty of fans, even if asking the right price might mean more than finding the right statue. Joe Becwar, an observant Catholic, said he sold his house in Southampton, N.Y., soon after his mother suggested the statue and his real estate agent told him to plant it head down, facing the house, by the “for sale” sign. His brother in Chicago had the same experience, he added. And Cheryl Katz, who is Jewish and works with Mrs. Bonadies, said the statue helped her sell two houses as a real estate agent. Now that her own house is on the market, she’s using it for herself. “You want to believe in something,” she said.